Boston, MA – July 23, 2014 –Michael Strahan, defensive end for the 2007 Super Bowl Champion New York Giants, and co-host of Live! With Kelly and Michael and Natasha Bedingfield, the British-born singer/song writer will help kick-off a $1 million fundraising campaign designed to assist CareOne/HealthBridge employees and their families, as well as researchers, in the fight against cancer. 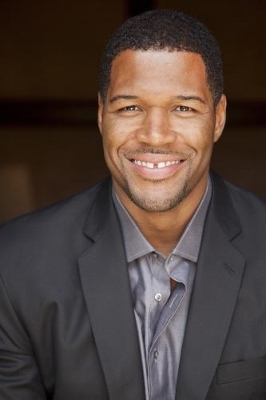 Strahan, the newest member of the Good Morning America team and co-host of Fox NFL Sunday, and Bedingfield, the award-winning performer, will join top R&B artist Ne-Yo at the July 27th event at Fenway Park for which Strahan will serve as master of ceremonies. Launched by Daniel E. Straus, Founder, Chairman and CEO of CareOne Management, the campaign and fund were developed in support of HealthBridge executive Dan Grimes, 42, of Carver, Massachusetts, who has been diagnosed with Stage IV lung cancer. Widely recognized for his commitment to a “hands-on” approach to philanthropy, Strahan contributes his time and talents to diverse organizations, working with children, members of the armed services and veterans. “I am inspired by CareOne’s efforts to support one of its own. On Sunday, the company will be raising more than funds at Fenway, they will be raising hope. It is an honor to take part in this event and I look forward to my time in Boston,” said Strahan. An activist whose charitable work takes her around the globe, Bedingfield, the recipient of numerous industry honors and accolades for a string of hits including “Unwritten” and “Pocketful of Sunshine,” was eager to join forces with CareOne. As the Southeastern Massachusetts regional manager for HealthBridge, which has 15 healthcare facilities in the Commonwealth, Dan Grimes has spent his professional career caring for others. A dedicated husband and father of four children under the age of 12, his life took an unexpected turn when he was diagnosed with Stage IV lung cancer, despite having never smoked. When word of Dan’s illness reached senior management, Straus announced that CareOne and HealthBridge would launch a fundraising campaign to help employees like Dan meet the unexpected expenses that often arise when family members are coping with a challenging diagnosis. Grants from The CareOne Cancer Fund in Honor of Dan Grimes, will allow employees and their families to focus on their recovery and support essential research. The Fenway Park fundraiser is expected to attract more than 1,000 participants, including many of Dan Grimes’ co-workers and friends, who have already launched smaller fundraising events in the Massachusetts communities where HealthBridge operates skilled healthcare facilities, as well as in New Jersey where CareOne operates 29 facilities. “This is the toughest battle I’ve ever had to fight. But thanks to my colleagues and CareOne, I know I’m not fighting alone,” said Grimes. In addition to performances by Bedingfield and Ne-Yo, Sunday’s event, which runs from 4:00 to 8:00 p.m., will feature a special appearance by Jack Edwards, play-by-play announcer and the television voice of the Boston Bruins and a longtime advocate for cancer-related causes. Tours of the historic ballpark, food, raffles and other family-friendly activities will round out the program. Tickets are $100 for adults and $20 for children under 12 and can be purchased online at http://care-one.com/save-dan. For more information about the event, please visit www.care-one.com. The CareOne Cancer Fund in Honor of Dan Grimes, Inc. was established to improve the quality of life for employees and their families who have been significantly impacted by the effects of cancer. That support will include financial assistance when the loss of income and the expenses associated with medical treatment creates hardship. Grants will help cover the cost of necessities as well the purchase of cars, appliances and tuition. Equally important, grants will also support cancer research.